This SUV has won numerous Large SUV of the Year awards from dealers and car rental agencies because of its popularity among customers. As a package, it's very difficult to beat with its custom interior features, power and control, advanced safety features, comfortable seating, great fuel efficiency, and spacious cargo area. Practical, great to drive, good value, smart interior, and affordable, it is easy to see why the Skoda Kodiaq is such a popular model. 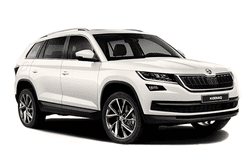 Car rentals are a big deal but you are making a great choice with this newest offering from Skoda and you are sure to be the talk of the town thank to your great taste in style and luxury The Skoda Kodiaq can be yours but act now before they are gone!